Rose Gold Hair Color - Yes or No? Do you guys follow Kristin Ess on instagram? If you don't, you should. I love her style, personality, talent, and how she shares on her feed. It's all so lovely! She started sharing her expanding her current line which is exclusively sold at Target and I saw within that collection, was a Rose Gold temporary hair color. You spray it on and it will give you a subtle rose gold tone that last 2-4 washes. I'm have an issue with committing to color. I don't like it. I'm a neutral person but this intrigued me because it wasn't a huge commitment. I could manage a week or 2 of this (because I don't wash my hair every day) so I went for it. It was just the right amount of color to pop and make it fun, it lasted about 10 days for me with my washing cycle, and it was really easy to style with my outfits and what I normally wear. Win win win. What's your vote? Would you do this for a little change? I also love this collection because she added a purple shampoo for us blondes to the bunch and it's incredible. Keeps me from looking yellow and brassy - shampoo HERE and conditioner HERE! 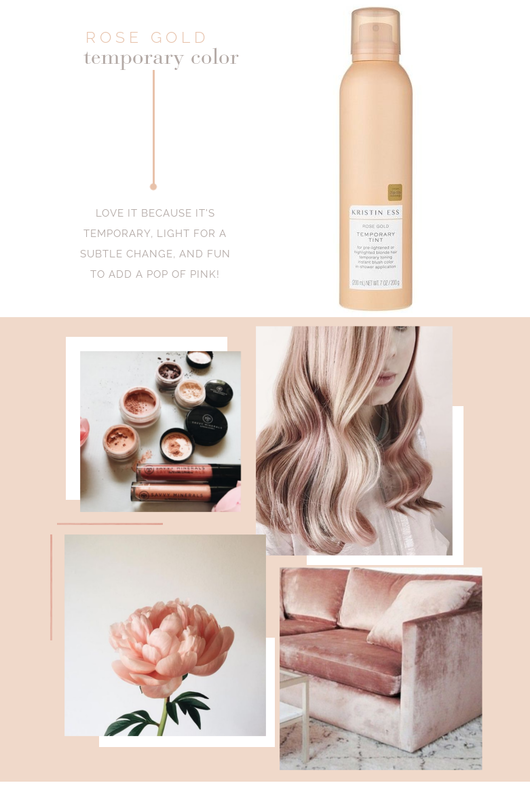 KRISTIN ESS ROSE GOLD TEMPORARY COLOR SPRAY + MORE!